If a province were to guarantee a rate to most of its suppliers, regardless of demand, I would expect supply wouldn't drop as significantly as demand would during an economic downturn. In Ontario the mechanism to recover the full charges paid to suppliers, from wholesale customers, is referred to as the Global Adjustment (by the IESO, which uses the shorthand GAM for the Global Adjustment). I suspect a mechanism to recover the higher price, such as the global adjustment mechanism (GAM), might have trade implications too, as it causes some distortion of the rates between domestic and foreign markets. 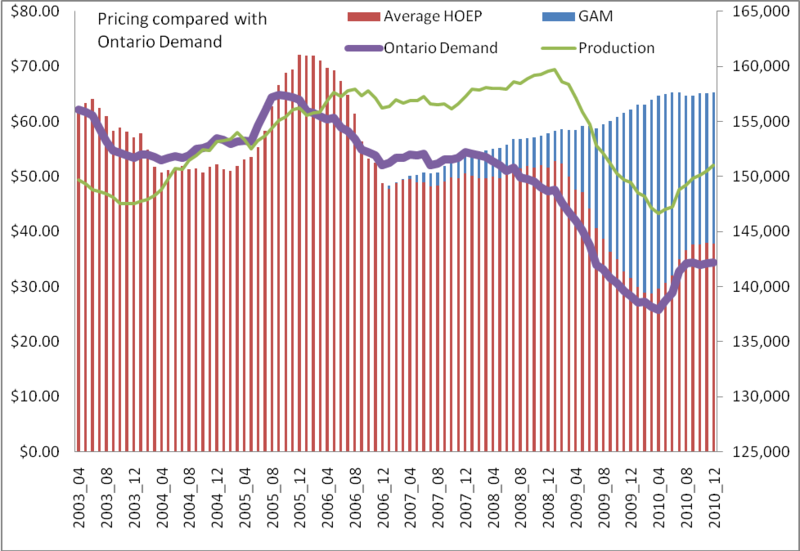 For instance, in Ontario the excess production has been dumped in Michigan and New York, at the market rate for that time (aw 2010 came to an end Quebec started to take a large share of the excess). I estimated the cost of that exported electricity over what was paid by our neighbour states – this amount will be on your bill either as a portion of the global adjustment/provincial benefit, or worked into the RPP or TOU rate calculation. 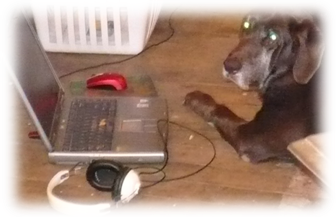 I took the total paid at the HOEP rate, for exports, and subtracted it from the combined total if both HEOP and GAM, combined, reflected the price paid for the same output to suppliers. 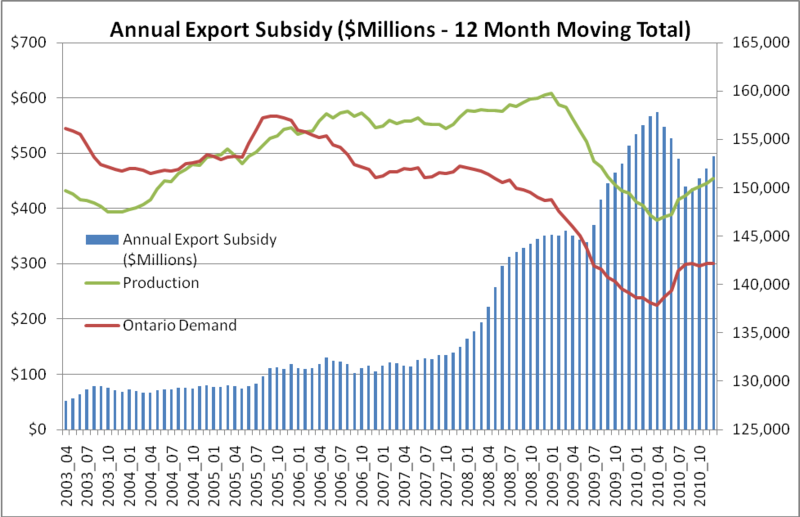 This is the best method I could conceive of to try and quantify the costs of the escalating exports. 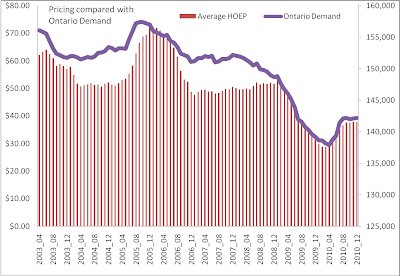 The gap where supply did not meet demand back in 2003 was largely closed by nuclear as Bruce A units 3 and 4, and Pickering Unit 1, came back online by 2005, . That's a mixed blessing economically as nuclear runs 24X7 (or not at all). 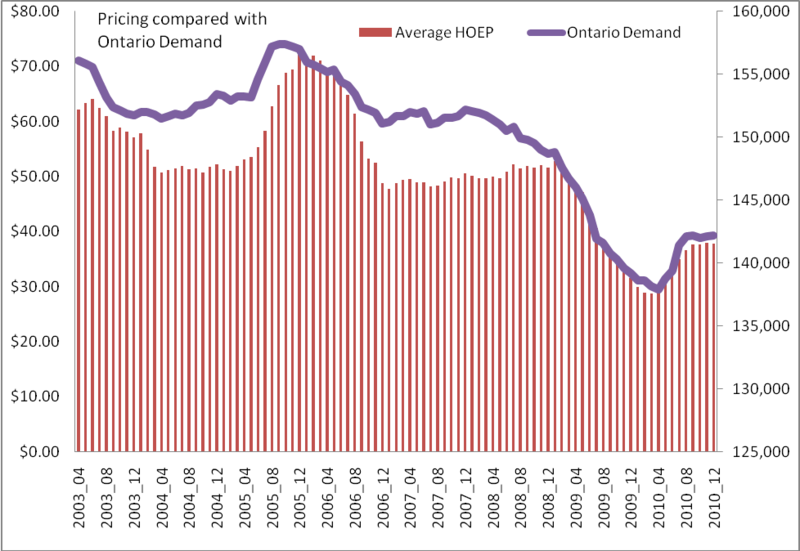 Not guaranteed rates are coal, and a declining amount of hydro (because most of it is owned either provincially or municipally, the HOEP price crash resulted in lower than anticipated public revenues – so they are now starting to be awarded contracts from the OPA - at higher rates). These are the supplies that do get reduced as demand falls – which again isn't entirely economical. Economic models don't dictate rejecting the cheapest product for far more expensive product from an external supplier.